I try to read broadly, but probably read just way too much contemporary American fiction*. I discovered Ray Robinson‘s Forgetting Zoë by accident. Firstly the cover appealed, and then the setting – Arizona (at least for part of the book) – my passion for four corners states, and surrounds, continually fed by some excellent literature. 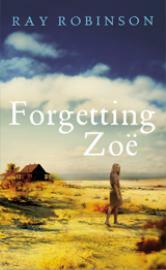 Forgetting Zoë is an exceptional story, told to a certain extent as if it was a straight crime novel – there’s a crime, there’s some mystery to the solving of that – but beyond that it’s really a literary novel, savouring the words themselves throughout, while still maintaining pace and intrigue. The novel certainly seems to draw on events that have been in the media over recent years – the story focuses on the abduction and imprisonment of Zoë, and the experiences of the families involved. Robinson’s attention to setting is striking – the novel is set between the dry heat of Arizona ranchlands, and an island off Newfoundland, cold and weatherbeaten. *What I didn’t realise during the reading of the book is that Robinson is British. I’m surprised by what a good ear he has for writing fiction that fits with other mid-west novels. This entry was posted in fiction and tagged crime fiction, forgetting zoe, literary fiction, novel, ray robinson on 17 November, 2010 by Sean Monaghan.